This is the system which will soon take over completely from the above analogue TV. Offers around 24 channels of TV plus several radio channels and some subscription only channels. Digital reception either works, or it doesn’t work – there is no middle ground like analogue of a gradually deteriorating picture. Once analogue is gone digital signal strength is due to increase and more channels to appear in the spare bandwidth. There is no such thing as a ‘Digital Antenna’. Any antenna designed for the band upon which the digital signal is transmitted, will work if the signal is strong enough. All antennas designed for caravan use are wideband. The directional ones will produce better results than the omni (all directions) of the Status ‘flying saucer. The later has the advantage that it needs no setting up, or pointing in the right direction, but will get a less strong signal. My own flying saucer works reasonably well. A problem with the directional one is which way should you point it, when your TV may need to scan to find the channels in the first place. Whilst there is analogue available it can be easiest to first set it up tuned to analogue channel then tweak the direction for a good signal, before finally switching over to digital and letting that scan for channels. 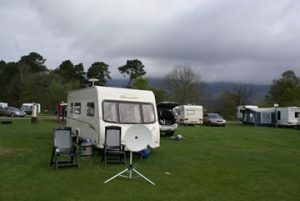 Many of the wilder parts of the UK, or mountainous areas will not provide any reception at all – these are the types of area I like to holiday, which might explain some of my bias towards satellite. This is the system able to receive the channels which are transmitted from Astra 28 E (though there are several other satellites to choose from), which also carries the Sky encrypted channels. It carries the basic five channels, lots of rubbish, lots of film channels and very many others along with foreign language ones. Basically – many more watchable channels than Freeview. All that is needed is a SCART socket on your TV and one of the satellite Suitcase type kits and it works on 12v. So far as reception goes, you can get a signal absolutely anywhere in the UK where you can see a clear view of the sky, looking south east and up at an angle of 45 degrees to horizontal, which includes mountainous areas. It also has the advantage of offering all of the local ITV/BBC regional transmissions, so no matter where you are you can still watch the TV from your home region of the UK. I live in Yorkshire and can watch YTV in Cornwall if I wish. Unlike analogue and Freeview, the channels stay put, so no need to retune the receiver as you change to a different part of the country or a different transmitter. For this you need a Sky receiver, a viewing card and 240v. So far as I am aware the channels are quite limited, though I have never tried it away from home and no longer even subscribe to Sky at home. I have my own (suitcase) dish mounted on a short section of awning pole flattened at the end, which I simply hammer into the ground. It provides a good solid mount and needs no other fixing even in the strongest winds. Unlike a terrestrial antenna there is no advantage to be gained by mounting a dish high. Aligning it to Astra 28 is the work of just a few minutes with the ‘sat finder’ supplied with this type of suitcase system – a combined inclination meter and compass which snaps onto the rear of the dish. You just dial in the satellite you want to receive and turn the dish to align it. When compared to trying to both point an antenna and scan for channels of the terrestrial alternative it is a doddle and you are almost guaranteed good reception of all channels. My own system has the small receiver ready set up under the TV and the dish, mounting pole, cable and LNB in an ordinary carrier bag as supplied by supermarkets. It is also much smaller and lighter than carrying a pole mounted directional antenna. Coverage of the UK is pretty good, but as you move north the signal does become weaker. Some report that the suitcase basic dish becomes unusable in the north of Scotland, but for us it worked well enough. The solution is simply to obtain a larger dish to increase the signal.